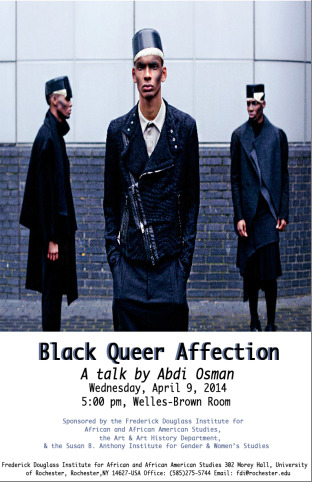 Abdi Osman is a Somali-Canadian multidisciplinary artist whose work focuses on questions of black masculinity as it intersects with Muslim and queer identities. Osman's video and photography work have been shown in Canada and internationally in both group and solo exhibitions. He holds an MFA in Documentary Media from Ryerson University, and B.A. in African Studies from the University of Toronto. Previous work has been supported by a grant from the Ontario Arts Council. His photographs are also in private collections and the Art Bank of the Canada Council for the Arts. Some of his work was in the year-long group show DiaporaArt: Strategy and Seduction by Canadian Artists from Culturally Diverse Communities at Rideau Hall. Abdi was a 2010 artist-in-resident at the McColl Centre for Visual Arts in Charlotte North Carolina. Most recently in 2012, he was a fellow at The Interdisciplinary Center for Culture and Creativity (ICCC) at the University of Saskatchewan. Sponsored by the Frederick Douglass Institute for African & African-American Studies, the Art & Art History Dept., and the Susan B. Anthony Institute for Gender & Women studies.